Marshall represents national lenders in all types of financial transactions, including asset-based lending, cash flow financing and syndicated credits. 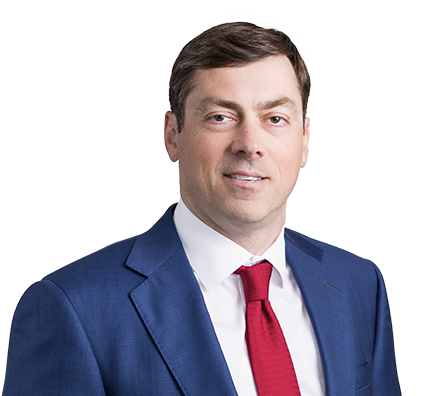 He also advises clients on all aspects of financial restructuring, especially in connection with distressed mergers and acquisitions, workouts and bankruptcy. Counseled Algonquin Power Co., as secured lender, in Trafalgar Power Inc. bankruptcy proceedings and sale, pursuant to Section 363 of the Bankruptcy Code, of seven hydroelectric power facilities. Advised Green Plains Inc. on purchase, pursuant to Section 363 of the Bankruptcy Code, of four biofuels plants in Abengoa Bioenergy US Holding LLC bankruptcy cases for an aggregate purchase price of $250 million. Served as co-counsel for agent to first-out debtor-in-possession lenders in Patriot Coal Corp. bankruptcy. Represented HMC/CAH Consolidated Inc. and its 12 operating affiliates as debtors-in-possession in Chapter 11 bankruptcy in Kansas City, Missouri. Helped system of 12 rural hospitals with annual revenues of $100 million reorganize and emerge from Chapter 11 within 15 months of filing as true reorganization, without closing or selling a single hospital. Assisted in Chapter 11 reorganization of 12 critical-access hospitals that resulted in confirmed plan of reorganization. Advised national lender on numerous equipment and inventory financing transactions. Represented retired executive in ERISA claims against former employer for supplemental executive retirement plan (SERP) payments. Represented ION Media Networks Inc. in formulating and obtaining confirmation of creditor plan of reorganization in Roberts Broadcasting Co. bankruptcy cases, pursuant to which ION acquired three broadcast television stations. Counseled U.S. Bancorp Community Development Corp. in bankruptcy proceedings of PBS Lumber Manufacturing, a qualified active low-income community business (QALICB) borrower under federal New Markets Tax Credits (NMTC) program. Represented individual in Chapter 11 bankruptcy of business partner and subsequent purchase under Section 363 of Bankruptcy Code of debtor's 50 percent membership interest in shopping center. Advised sushi restaurant chain on bankruptcy-related purchase of three operating restaurants. Represented Fortune 100 company in electronic retailer bankruptcy case that resulted in payment in full of $8 million floor-plan line of credit. Advised GE Commercial Distribution Finance in electronic retailer bankruptcy case that resulted in payment in full of $8 million floor-plan line of credit. Represented Enterprise Bank, as senior secured lender, in local Chapter 11 bankruptcies filed by Whitney Design Inc. and Bernadette Business Forms Inc. Advised Credit Suisse Asset Management funds as first and second lien lenders in Land Investors LLC Chapter 11 case.